I’m going to dive right in (pun totally intended): shark dives are a rather controversial topic. There are those who believe that we shouldn’t mess with the marine ecosystem or sharks’ natural behaviour by feeding them. In general, I wholeheartedly agree. But Fiji shark dives, for me, are an exception. For example, I would never go swimming with the whale sharks in Oslob. Apart from the effects on their diet, many of them have sustained injuries from coming too close to boats and people often touch them (also they’re not supposed to). In order to provide a balanced viewpoint, I should add that the whale shark tourism industry has brought new life and much-needed income to the people of Oslob. There are concerns that tourism would drop if they ever stopped feeding the whale sharks, because sightings would no longer be guaranteed. In my opinion, you might well see fewer tourists who are only interested in ticking whale sharks off their bucket list. But they would gain tourists like myself, who are interested in responsible and sustainable tourism. Look at the nearby island of Malapascua, for example. 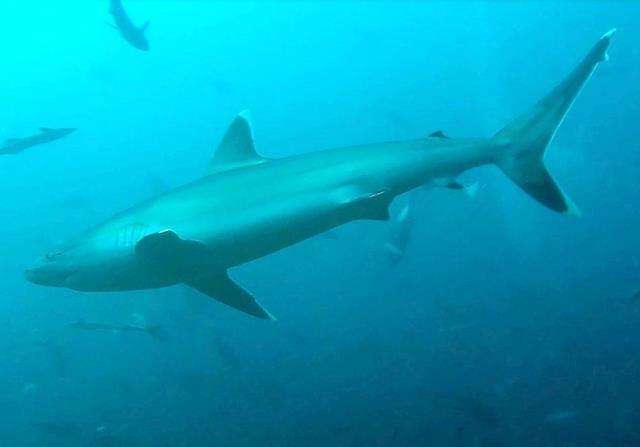 A thriving tourism industry built around thresher sharks has grown there, but they don’t feed the sharks. 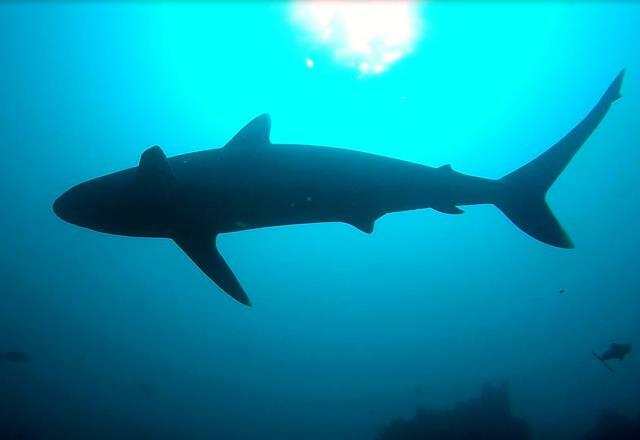 Nevertheless, I’ve come to believe that shark dives, when done properly like in Fiji, are beneficial for a few reasons. They enable valuable shark research to be conducted. They raise awareness and incentivise local fishermen and governments to support conservation efforts. Given that overfishing has drastically reduced sharks’ sources of food, I think that feeding them occasionally could actually bring a little balance back to the marine ecosystem. In fact, they are fed with fish heads, which most of us don’t eat – that’s reducing food wastage! Tissue samples from the sharks show that only 30% of their diet comes from these feedings, so it’s not like they’re becoming too dependent on humans and losing their natural ability to hunt. Since this is diving, the sharks never come anywhere near the boats and the number of divers is restricted. Beqa Adventure Divers (BAD) in Fiji is a great example of how to do it right. 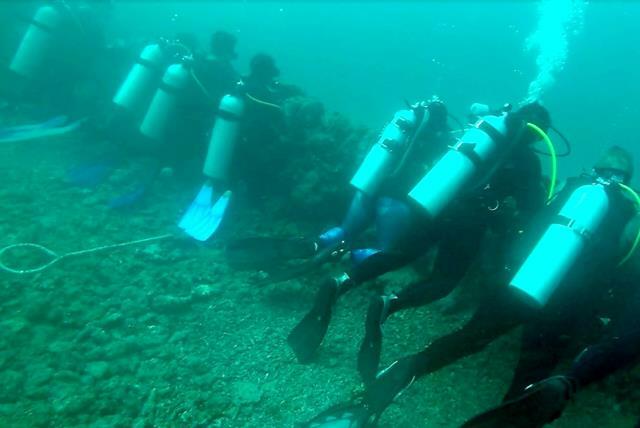 We did a shark dive with them, and in between dives, they told us a little more about what they do. I was greatly impressed. 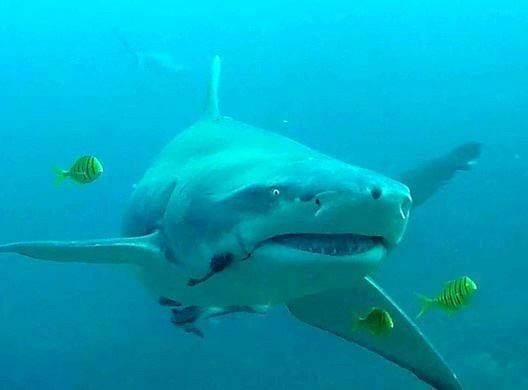 BAD’s main conservation and research focus is on bull sharks, although they do feed other sharks. They started their efforts back in 2001, when they agreed to pay the local villagers FJD25 per customer in exchange for the villagers ceasing to fish in that area. At first, the newly-established marine reserve was barren. 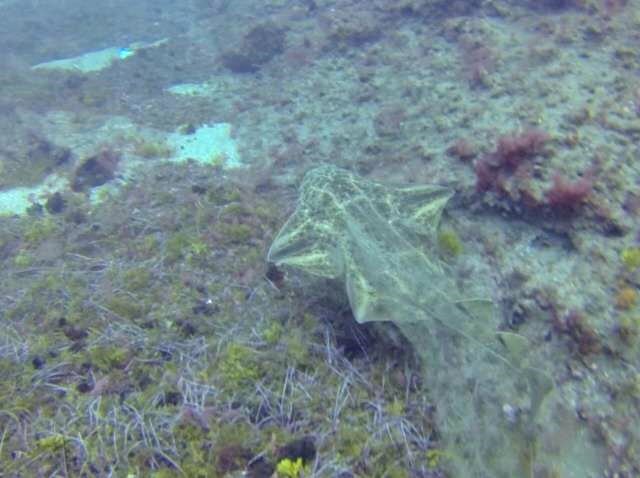 But slowly, the fish (and the sharks) came back, and today divers can enjoy a marine reserve teeming with life. In fact, this initiative has been so successful that it was officially designated Fiji’s first National Marine Park in 2014! The fishermen have benefited too, as the overall increase in marine life means more fish being caught (outside of the reserve area). BAD do tagging and monitoring of the sharks. They have identified over 100 individuals based on their unique markings. For example, in the picture below you can see a bull shark whose second dorsal fin is almost completely gone. Read more about BAD’s conservation efforts here. The divemasters act as bodyguards to push away any sharks which might get too close (using that metal prong you see above – but not with the sharp end). In truth, though, the sharks couldn’t have cared less about us. They completely ignored us, as they were far more interested in the fish heads! It’s a real shame that sharks have such a bad reputation. 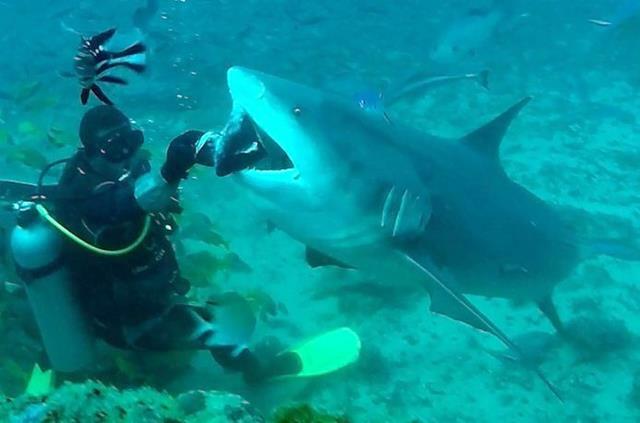 Most cases of “shark attacks” are actually due to the shark mistaking the human for food (e.g. a person paddling on a surfboard has a similar silhouette to a sea turtle), and they let go immediately once they realise their mistake. And did you know that more people are killed by electrocution by Christmas tree lights than by sharks? Conclusion: let’s do our own research, take reasonable precautions and not succumb to fear-mongering. As you probably already know, shark populations all over the world are in serious danger of extinction. This is due to a couple of reasons. Probably the most well-known is the demand for shark fin soup. As a Singaporean Chinese, I can tell you first-hand that shark fin soup is very valuable in Chinese culture. It’s often served at special occasions like weddings and important dinners, and being able to serve it to your guests can be viewed as a symbol of status (“I can afford this”) or generosity and respect (“this is expensive but I value your presence so much, I will order it anyway”). In recent years, increasing affluence has come with increased demand for shark fin, and the horrific practice of shark finning. This is where sharks have their fins cut off and then get thrown back into the ocean, as their meat is much less valuable than the fin. Unable to swim or balance properly, they either starve to death, get eaten alive by other fish, or sink to the bottom of the ocean and drown (as water needs to flow through their gills in order for them to extract oxygen from it). Not only is this shockingly inhumane – the fact that sharks grow slowly and take years to reproduce means that they are being killed at unsustainable rates. If you have the emotional fortitude, you can read further depressing details here and here. A second reason is that sharks are caught as bycatch. Many fishing techniques and equipment are not very selective and many sharks are unintentionally caught in this manner. They’re subsequently discarded (often after having their fins removed) because they weren’t the targeted species. Did you know that a shark may have died for your lipstick? Many commercially produced cosmetics (including skincare and make-up) contain a compound usually derived from shark liver oil – squalene. It’s not just about shark finning. Shark “livering” (where they harvest the shark’s liver and toss the rest of the carcass back into the ocean) is also a real thing. What’s worse is that there are abundant alternatives to shark oil, such as olive-derived squalene. Whether you like sharks or not, they play a vital role in ensuring the health of our oceans. As apex predators at the top of the marine food chain, sharks are vital to the ecosystem by keeping the populations of the species below them in check. Losing them eventually leads to the death of coral reefs and the collapse of fisheries. Given that the ocean is a major food source for the world, this should matter to you, even if sharks (in themselves) don’t. For starters, don’t eat shark fin. I think progress is being made on this front: it is becoming increasingly common here in Singapore not to serve shark fin soup at wedding dinners, and high-profile Chinese celebrities such as former NBA player Yao Ming are spearheading campaigns to raise awareness. You can also help to educate those around you on the dangers facing sharks, and why they’re so important. Do some research on what skincare and make-up you use – do they use squalene? MNCs like L’Oreal and Unilever have agreed to stop using shark oil in their products, which is a great step in the right direction. 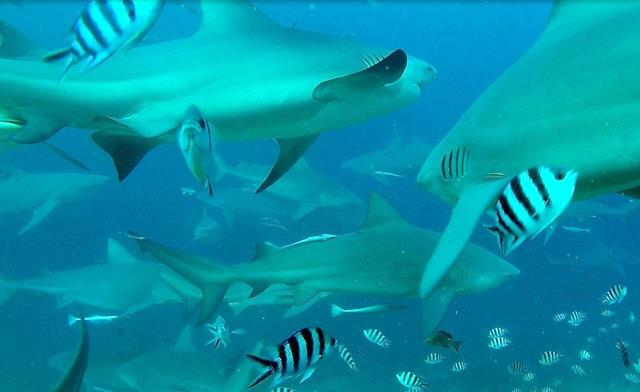 Finally, consider diving in a shark sanctuary – this will help promote its long-term sustainability and financial viability. You’ll be supporting the economy of a community that has chosen to protect its sharks instead of hunting them. Bear in mind how easy it is for them to give up if it doesn’t make sense financially for them! 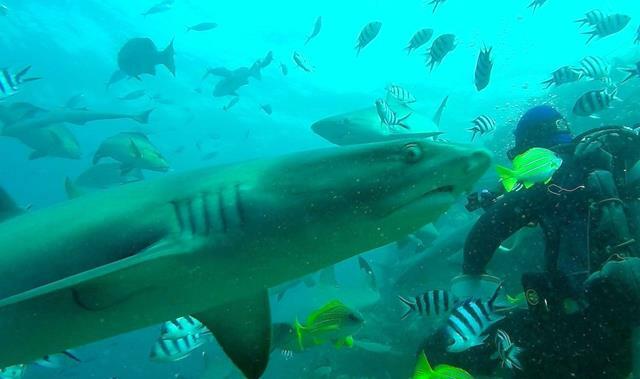 Plus, you’ll be rewarded with an unforgettable experience – seeing sharks up close and personal. 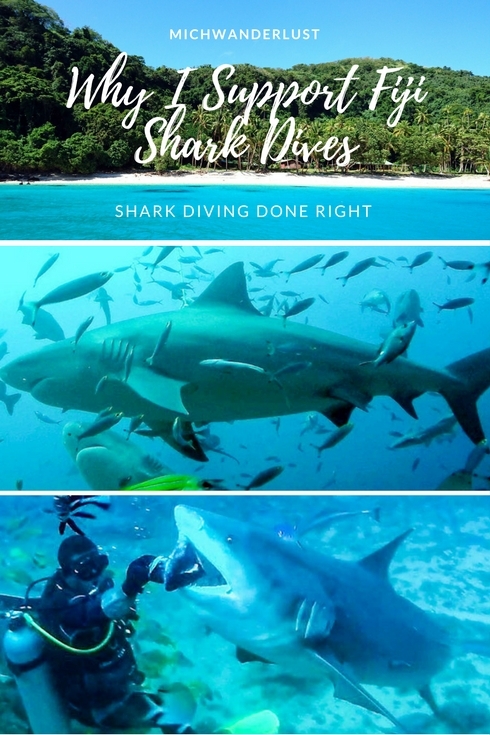 Next, read about my shark diving experience in Fiji. Would you go for a Fiji shark dive? Do you have any other tips for shark conservation or marine conservation in general?